Birds of very different feathers fly together in this fascinating walk-through exhibit showcasing everything from herons and hornbills, to penguins and woodpeckers. 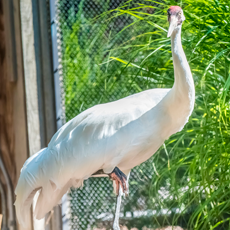 At roughly 60 inches in height, the whooping crane is the tallest bird in North America. Whooping cranes mate for life. The whooping crane’s courtship dance involves leaping, head-pumping, kicking and wing-sweeping. Herb and Nada Mahler Family Aviary.